The cast of Downton Abbey may seem all snooty and old-timey, what with their British accents, impeccable grammar, and fancy-pants table manners. But they’re really just regular, modern-day actors and actresses who have iPhones, watch Star Wars movies, and like to stage lightsaber battles between takes, just like the rest of the world. The proof is Downton Wars: Episode 1 - The Phantom Valet, a smartphone-shot Star Wars spoof by actor Rob James-Collier, who is so associated with his conniving Downton role of Mr. Barrow that he has a website called EvilButler.com. James-Collier originally made the film as part of a fundraising campaign for the Chilterns MS Centre in Aylesbury, Buckinghamshire U.K. He was running a marathon in the charity’s name back in April and seeking £10,000 in sponsorship money, and this seemed like a clever way to get the internet’s attention. 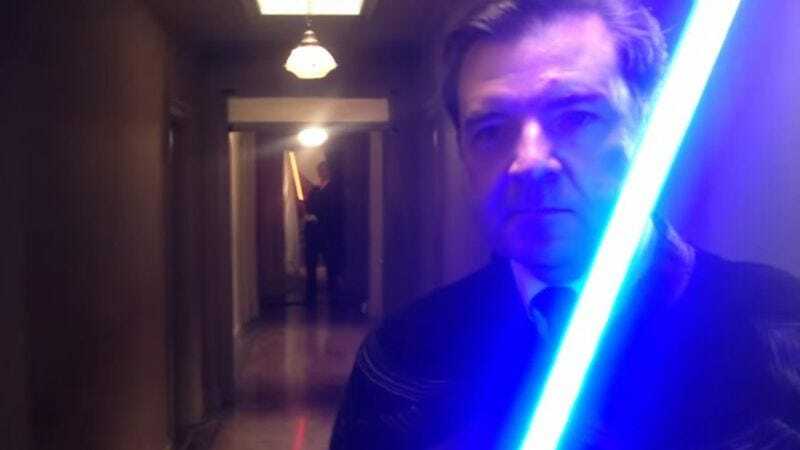 The first Downton Wars clip is a rather modest affair, largely focusing on an abortive hallway duel between James-Collier and fellow Downton valet Brendan Coyle. The actors are almost immediately called away from their lightsaber-swinging antics by Jim Carter as humorless Mr. Carson. A butler’s work is truly never done. The installment’s best performance is given by Joanne Froggatt, who has no time for this “disturbance in the Force” nonsense. “Are you sure,” she asks Coyle, “it’s not just your irritable bowel?” Curiously, John Williams’ familiar theme is absent here, replaced by the doubly incongruous “In Da Club” by 50 Cent. Upon successful completion of the first phase of the project, which to date has raised £16,314, James-Collier has now posted the sequel to The Phantom Valet—entitled Downtown Wars: Episode 2 - The Evil Butler Strikes Back—on YouTube. The film had previously been available exclusively to only those who had donated. (And, yes, nerds, he is mix-and-matching the original trilogy and the prequel trilogy. Deal with it.) The actor is still soliciting donations for the Chilterns MS Centre and promises he will release a deleted Downton Wars scene if his video reaches 100,000 views. The opening credits explain that this is an extended “but not necessarily better” version of the video “with more lightsabers in it.” In that spirit, James-Collier and Coyle resume their duel, chasing each other from the hallway to the dining room to the kitchen and beyond, passing other nonplussed Downton cast members, including Dame Maggie Smith, in their travels. Along the way, such non-Star Wars films as The Warriors and Taxi Driver are also quoted, and there’s some horror movie/werewolf stuff thrown in for good measure. For anyone who has ever wanted to see the Dowager Countess wield a lightsaber—and that should include just about everybody—The Evil Butler Strikes Back is a must-see.